Nokia is hoping that availability of its low-end Lumia 525 in countries like China and Russia will soon give its smartphone sales a boost. The phone is a variant, though not an outright successor, of the Lumia 520, and helps Nokia offer Windows Phone at a more accessible price to a larger number of users, a spokeswoman said via email. The smartphone will go on sale before the end of the year in China, Vietnam, Hong Kong, Cambodia, Singapore and Russia. In China, it is priced at 1099 yuan ($180) before taxes and subsidies. It will then go on sale in Australia, New Zealand, Ukraine, Khazakstan and parts of Africa during the first quarter of next year, according to Nokia. During the third quarter, Lumia sales increased by 19 percent quarter-on-quarter to 8.8 million units, reflecting strong demand particularly for the Lumia 520, Nokia said. 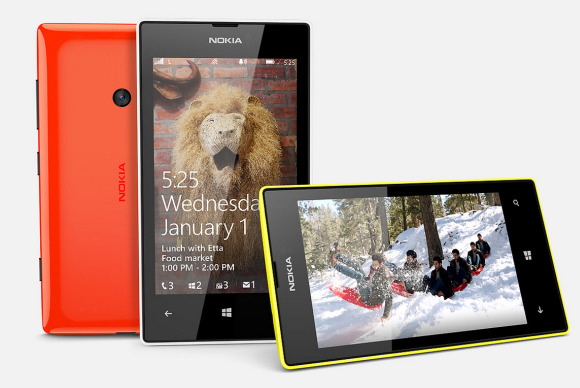 The Lumia 525 and the expanded distribution it brings, then, is important to Nokia. Other than 1GB of RAM, rather than 512MB, the specs of the Lumia 525 are identical to what users get with the Lumia 520. That includes a 4-inch screen with a resolution of 800 by 480 pixels, a 5-pixel camera and dual-core 1GHz processor. There is also 8GB of integrated memory and a microSD card slot. The market for sub-$200 smartphones is at a crossroads, mostly thanks to Google's efforts. The recently announced Moto G from Google-owned Motorola Mobility costs as much as the Lumia 525, but is powered by a 1.2GHz quad-core processor and has a 4.5-inch 720p screen. Even though the Lumia 520 has helped increase the popularity of Windows Phone, Nokia and Microsoft can't afford to rest. Their main priority should now be to bring down the cost of Windows Phones to below $100 without a contract, said Pete Cunningham, principal analyst at Canalys. Nokia shareholders last week voted to approve Microsoft's acquisition of "substantially all" of the company's Devices & Services business. The deal is expected to close during the first quarter of next year.